Hola mis amigos, Guatemala has me now. Once de la noche en Irlanda. 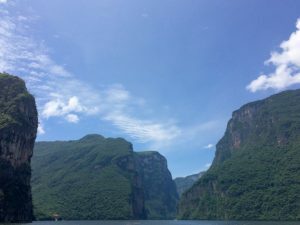 Cinco de la tarde en Guatemala. Friday evening here in Xela, the heavens have opened up, so no better time to pen a few notes on what has been going on over the last month. My Spanish is progressing well, another productive week under the belt. When learning anything new there are the ups and downs but it feels great when you come off the back of a good week. One of the things I have found particularly helpful is reading the business section that comes in one of the local newspapers every Tuesday and using it as a learning tool with my teacher. 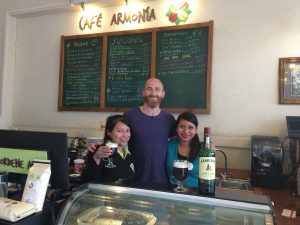 Bringing a little bit of Ireland to Café Armonía. When you are learning a language and you have those off days it is easy to lose sight of how far you have come. One positive I take is that two weeks ago I had an interview completely in Spanish for a fellowship opportunity with Alterna Impact, the impact investment firm I wrote about in my last blog. More on that opportunity below, but even just from the Spanish perceptive it was a nice reminder that I am progressing. Of course, I know it is still a long path ahead to full fluency. Roma no se construyó en un día (Rome was not built in a day). The beauty of this adventure is being fully engaged in life but in the sense of simply going with the flow rather than forcing or chasing some end destination. As I wrote a few months back, “no hay prisa” (there is no rush). I meant it. I am still in Xela because it feels right and it has presented me with more opportunities to develop. My main goal of becoming fluent in Spanish is progressing well and this is the place to make it happen. Most recently I have been presented with another opportunity. As you’ll have gathered from my recent blogs the world of impact investing intrigues me. So to have the opportunity to work in the sector was something I couldn’t turn down. Last week I accepted an offer from Alterna Impact, the impact investment firm I wrote about in my last blog, for an investment fellowship with their business cultivation team, thereby agreeing to commit another four months to life here in Xela. I am very excited about this for a number of reasons. First of all, I had three or four meetings with various people from Alterna before they put the offer to me and I can tell they are going to be good people to work with. I would describe it more as a collaborative process to determine where my experience can lend itself to the development of Alterna’s investment process balanced with my desire to learn more about the sector and to work with entrepreneurs in Guatemala. I know I can make a worthwhile contribution but I am also going to learn a huge amount. Part of my mandate is a research project on best practices worldwide in the impact investment sector. So I am particularly interested to learn how impact investment firms are measuring the underlying social impact. This is one of the frustrations of investors who have capital to allocate to the sector, whether or not the underlying companies are delivering on their social impact objectives. Among other things, I am also interested to see how does a more socially conscious company take explicit consideration of negative externalities, such as the impact on the local environment, when assessing rates of return? Of course, investing with a social conscience still requires a viable investment case so ensuring a robust due diligence process will still be paramount as Alterna prepare for a new round of investment in Guatemalan entrepreneurs. Now not only will I be immersing myself in Spanish but I’ll be immersing myself in the world of impact investing over the next four months. The added benefit is that the vast majority of my interactions with colleagues, entrepreneurs and investors will be in Spanish. All in all, I see nothing but positives with this opportunity. I start this Monday (September 4th) and I am sure I’ll have plenty more to write on this topic over the coming months. I am convinced more socially conscious investing is the future. Businesses across the world need to be much more social conscious. Rising inequality, climate issues, and even human wellbeing are among the by-products of a system narrowly focused on maximising shareholder value. The impact on other stakeholders is an afterthought. Discussions of this nature tend to gravitate towards a capitalism/socialism debate, as people rush to one side or the other. There are no sides. We all share the same planet and unless the business world adopts a more socially conscious attitude we are all finished. Even if you leave aside climate change and the destruction of the environment, an unwelcome inheritance for future generations, more can be done now to create a more socially liveable environment for the current generation. Ireland is considered a wealthy country with a high standard of living yet I read today that nearly 400,000 medical card holders were prescribed anti-depressants in 2016, an increase of 50,000. It seems even if the planet does survive people will be too depressed to enjoy it! How can a business be more socially responsible even just a human level? If I was CEO (one day) I would start small and employ some creativity. I’d challenge and empower my colleagues to find mutually beneficial solutions. Long commutes at peak traffic hours are a mindless waste of energy. Allowing more flexible hours is a no brainer. I mean real flexibility. Two parents working has become the norm with kids being sent off to expensive crèches. Net net, nobody wins, except maybe the crèche owner. There has to be a better way. Children need their parents. All the toys in the world are not as valuable as a parent’s influence in the formative years. I’ll save the rest for my manifesto. I will say one last thing. Businesses can lead change but individual responsibility is the only thing that can sustain change. Do employees want to be treated like school children being told what to do or like adults with the autonomy to make things better in an organisation? No matter what someone’s position in an organisation I believe if you put trust in them they will repay it. Just like any team, there will be some not up to the challenge but over time you can build your team with people you can be confident in. One of the highlights of the last month was the week I spent in San Cristóbal de las Casas, Mexico, with a couple of friends from Xela. The tourist visa rules require foreigners to leave every 90 days, technically for a minimum of 3 days, and Mexico is the most convenient country to visit. It is a bit unusual but it is not the worst problem in the world to have. This was my third trip to Mexico and it is yet to disappoint (I won’t count my surreal Tijuana experience when I first moved to San Diego). The colonial city of San Cristóbal de las Casas is in the centre of the Mexican state of Chiapas, Mayan territory. The journey is a good 10 hours by bus from Xela due to the poor condition of the roads and time taken up at the border. For those flying, a flight from Mexico City to the nearby airport in Tuxtla Gutiérrez would be handy. The city is well worth a visit! The architecture, the cobbled streets, the people, the food and the nearby scenery all make San Cristóbal a special place. 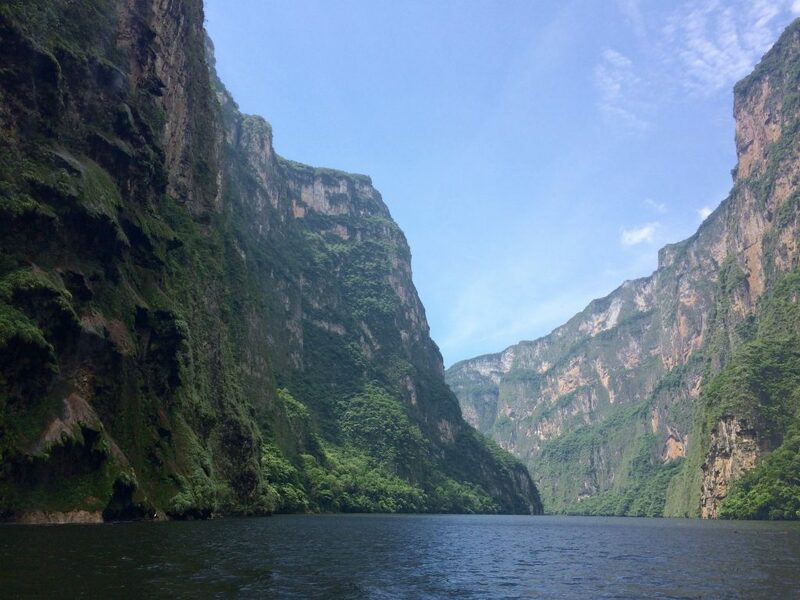 The natural scenery at the canyons of Sumidero, about an hour outside San Cristóbal, is spectacular. The free walking tour of the city is amazing. We had a guide named Carlos from Mexico City, a legend who claimed to be of Aztec decent and who could talk for Mexico, despite his love for the sweet Mary Jane. He was a man of the people and he brought my friends and I on an epic cave tour a few days later. 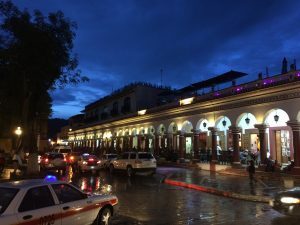 Due to its colonial style architecture the city has been likened to the city of Antigua, here in Guatemala, but for me San Cristóbal has much more character than Antigua and has yet to be invaded by the high end North American tourists. You know the package groups who are herded around the city like sheep, led by a guide with a flag in the air so that none of his flock strays. Of course you can only really appreciate a city when you stray aimlessly without any purpose. They tended to be our best days in San Cristobal. This coming Wednesday I’ll be four months into my American adventure, an adventure I feel could stretch much longer than what I might have anticipated before I left Ireland. Although in truth I’d no real timeframe in mind, preferring to leave the construct of time at home and to just live for the moment right now. A tad philosophical maybe, particularly for those focused on looking ahead rather than what is in front of them. I’ll see how the next four months go here, I might stay longer, I might start heading South, I’ll decide at the end of the year. I am focused on now. Don’t look too far ahead.